NKBA Eastern Carolinas is the local chapter that brings together local Eastern Carolinas Kitchen & Bath distributors, retailers, remodelers, manufacturers, fabricators, installers, designers, and other professionals – and provides a resource for local consumers to research, educate and connect with Eastern Carolinas Kitchen and Bath professionals. Hampton Kitchens of Raleigh, Inc. Ever enter an event or a new group of professional peers and feel like hiding in a corner? Not sure what to say to get the covers around started? Do you feel like your bragging when talking about yourself? We all could use more practice in networking and marketing. Using this meeting as a tool for new designers and students from our field, we will give direction and advice and practice to networking with each other in a comfortable setting. Approved for .1 NKBA CEU. Today’s economy requires you to be flexible, responsive, curious, and proactive (not reactive) in order to stay relevant to your ideal clients. In this fast-paced marketing environment, it’s easy to feel overwhelmed, overloaded and ultimately stuck in an old pattern. You may have burned out or lost motivation in the current chaos of unrealistic deadlines, constantly changing technology, and demanding customers. Before you can implement an effective sales and marketing campaign, you must first identify, reclaim, and redefine your inspiration for your business. By taking a big-picture approach, you will develop an inspired and well-defined 4-word business plan that will drive, clarify, and guide all your business goals and decisions. Identify & transform your most difficult clients into your best teachers. Learn & apply 3 steps to effective mission statements/taglines and why many fail. Rediscover core values & passion for the industry. Practice the role of intuition on first impressions to identify business values, take risks & rebrand successfully. Develop an inspired, well-defined 4-word business plan (yes, only 4 words!). Current design trends discovered on the KBIS floor as well as insights from the NKBA Annual Trends Report. Shiny, matte, textured, neutral, colorful, natural, man-made, recycled? Surfaces of course. Trending product introductions without being brand specific. Dawn has recently returned from the Milan Furniture show and will discuss trends found abroad. Dawn DeLuca is an award winning designer with over 25 years of industry experience as Principal of Interior Transitions, a design studio based in NYC and north-western CT. Also, as a Founding Partner of Camille Rossy, Inc, in NYC. Her projects span the eastern seaboard of the US and Europe. As a certified designer and professional speaker, Dawn has spoken to various organizations about many industry topics all across the US. An award winning member, of the NKBA, Dawn DeLuca has served as a volunteer leader on the local, regional and national levels, since 2005. She served as American North East Regional Director, as a Member of the National Board of Directors and the National Generative Council. She is currently the Programs Chair for the NKBA Manhattan Chapter. Dawn also serves as an Ambassador for the Living In Place Institute and as a Design Advisor for The Universal Design Project. Kindly register by November 1st in order to guarantee food. We cannot give refunds due to venue/catering deposits. Thank you to our sponsors for your support of our chapter and our members! Luxury Living: How to Create High End Additional Income Stream for You and Your Client! Join us at Lily and Brenda discuss how to create High End Additional Income Stream for you and your clients! Prepare for an energetic and exciting meeting! Approved for .1 NKBA CEU. Trust is something that we often take for granted. And in today’s highly volatile, ever-changing work environment where you have to build relationships quickly and across cyberspace and geographies, it can be hard especially when you have a broad and highly diverse network of associates and colleagues. This presentation will introduce new factors in establishing trust that go beyond the usual “competence and reliability” assumptions. The ‘trust formula’ calls for a more intentional and focused effort that is based not only on capability but also “connectability” and an honest, caring about others. The idea is to build and maintain trusted relationships BEFORE you need them. Harnessing the creative power of craftspeople can create a show-stopping project. With the public’s enthusiasm for artisan culture and its increasing appetite for the unique and handcrafted, integrating specialty work into interior design projects is gaining in popularity. Lauren Levant has been at the vanguard of this trend and will offer examples, advice and walkthroughs of how to successfully integrate unique components into a project design. Creative collaborations with local craftspeople, fabricators and artisans in the design of interior spaces and signature product pieces is a hallmark of Lauren Levant’s designs. Take advantage of this rare opportunity to see into this nationally recognized designer’s process and integrate this approach into your own. Provides inspiration to address the luxury homeowners who seek a custom, spa-like retreat that allows them to create a personalized, multi-sensory experience right in their own master bathroom. The year is almost over and we hope you will join us for our annual holiday party! This event is coming up fast, so REGISTER TODAY to ensure you won’t miss out. Tickets WILL NOT be available at the door for this event. Ticket sales end Tuesday, November 7 at noon. Sponsored by Wood-Mode Fine Custom Cabinetry, Inc.
We are very excited to welcome renowned chef, Sheri Castle, who will cook for us and speak about the versatility and use of great, high end appliances! From cooktops to convection ovens, Sheri will demo several of her signature recipes while she speaks about using high-end appliances in the residential kitchen. Sheri Castle is an award-winning professional food writer, recipe developer, cooking teacher, and speaker. She is a prolific writer who is known for melding storytelling, humor, and culinary expertise. Her writing credits include books, as well as nationally known magazines including Southern Living. Sheri developed the recipes for Sugar, Butter, Flour: The Waitress Pie Book, Pam Krauss/Avery, 2017, the official tie-in to cult-classic movie-turned-Broadway-hit musical, Waitress. Kindly register by Friday, October 6, in order to guarantee food. We cannot give refunds due to venue/catering deposits. We are excited to welcome Jennifer Gilmer, CKD, founder of Jennifer Gilmer Kitchen & Bath in Chevy Chase, MD, to present Holistic Kitchen Design. This course will help you understand how to create a successful design through approaching the kitchen space, as well as the spaces around it, with a holistic point of view. Taking the entire space into consideration (including breakfast, living, and family room areas) when designing a kitchen. Letting the room, as well as your intuition, guide your sense for the best cabinet and appliance placements. Jennifer will demonstrate how to cast a critical eye on your own and others’ work. We will see how incorporating holistic design can improve an existing space. We will take time to focus on more than the work triangle. Please register by Monday, September 11 in order to guarantee food. Jennifer Gilmer, CKD, founded Jennifer Gilmer Kitchen & Bath in Chevy Chase, MD, in 1997 and has established itself as a leader in the greater mid-Atlantic region with its 4000 square feet of showroom and a design team of 5 designers and 6 project management crew. Her showroom won first place in the KBB Magazine design contest in 2014 and was recently featured on the cover of KBDN Magazine. For many years now, granite has been the go-to product for kitchen counters. We are pleased to welcome Rob Bacon of DalTile to teach us about another less-commonly used alternative: marble. Marble has been used in kitchens for hundreds of years, especially in Europe, and is now on the rise in the U.S. This one-hour class is designed for residential, hospitality, and facilities management design professionals. It will focus on the use of marble in the kitchen. Learn more about the increasing trend of marble use in the kitchen. Obtain unique design elements of using marble for a countertop surface. Expand your ability to set the proper consumer expectation. Attendees will also learn that the use of marble in a kitchen will require different protective treatments. This is a course in lighting fundamentals that is focused on LED lighting. It covers the benefits and changes in LED lighting, the terms and definitions used in lighting design and light measurement. Information is conveyed through examples, contrasts and understandable definitions. Anyone taking this course will be more confident in their understanding of LEDs and the fundamentals of lighting design. This course is worth one CEU credit. A BIG THANK YOU TO OUR SPONSORS: ProKitchen Software and Hafele. For NKBA-related questions, please contact Mary Kate Bedell at mkbedell@thekitchenspecialist.com. You put tons of effort into making great projects, but does your business employ photography that best represents its high quality? Do your images compare to those in national design magazines? In this two-for-one program you’ll learn what to look for when hiring a pro AND how to create striking architectural photographs on your own and increase your bottom line. Hiring a professional often nets the best results – but not always. Architectural photography is not like any other. Knowing what will draw the viewer’s eye to what you want them to see, namely, your work, is critical. You’ll see how some photographers get it wrong, and how to avoid those mistakes. Want to try it on your own? Learn from a designer who is also a professional photographer. With some investment you don’t need to be pro to use pro tricks. You’ll learn about good camera and lens combinations, simple lighting tricks, where to place your camera, what to focus on, post processing and compositing multiple images, and much more. The NKBA Eastern Carolina Chapter has scheduled a professional photographer, Martha Manning of Martha Manning Photography, from 5:30-7:00. Martha’s photography has been featured in People Magazine, Oprah Magazine and Network, The Today Show, Huffington Post, Martha Stewart, Grace Ormonde, Southern Weddings, Weddings Magazine, and The Knot. Please join us for the meeting and have your head shot taken by Martha. The NKBA Eastern Carolina Chapter will distribute your photo within the next week via email. Health. Quality. Time. If we could get the healthiest, best tasting food results in a short amount of time, cooking would be a lot more fun, right? Please join us as Amy Taylor, BSH National Trainer, walks us through how we make this possible. Steam has become one of the largest trends spreading across America, and this course teaches us the why, what, and how of steam cooking. Meeting attendees are invited to attend an optional tour of the Bosch plant before dinner and presentation! Register online and save money! At-the-door Tickets cost more and require payment by cash or check. Once you have registered and received your order confirmation for this event, register for the plant tour. Sponsored by Bosch and Thermador. For questions about the Bosch Plant tour, please contact Gary Booth/BSH Home Appliances Corporation at gary.booth@bshg.com. Get a jump on celebrating the holidays with us! We have a fun-filled evening planned with mouth-watering food and two venues! We will begin the evening at Kitchen & Bath Galleries where a private chef will prepare dinner and side dishes. After dinner we head up to road to R. Jacobs Fine Plumbing & Hardware for dessert and wine. Please pre-register by Monday, November 14 to guarantee food. If you have any questions about this event, please send email to anne@freshkitchenandbathdesign.com or erin@hamptonkitchens.com . Sponsored by Sub-Zero, Wolf, and R. Jacobs. We are pleased to welcome back Denise Butchko, who is going to “walk us through” the process of designing and selling a walk-in closet – because if you’ve already sold the bathroom renovation, why not do the easiest add-on ever and design the closet space? But before Denise begins her presentation, Hafele has a special treat for attendees who are able to arrive early. At 4 pm, Hafele will conduct a tour of the factory for a minimum of 5 people. Attendees will learn how to apply basic design principles when assessing a walk-in closet space, understand the differences between working with closet components versus kitchen cabinets, and discuss budgeting options intelligently. Please pre-register by Monday, October 10 in order to guarantee food. Selecting natural stone for your clients involves more than just choosing the right color. We are pleased to welcome Robert Bacon of Daltile as shares with us: The Art of Specifying Natural Stone. In this session, Robert will discuss the resources you need to help ensure the stone you choose meets the standards and design intent set for your application. What do you need to know about its species, color variations, and finish possibilities? Is the quarry able to produce the sizes and quantities you need? What factors affect the price of the stone you specify? — Discuss the responsibilities and liabilities of each pillar in the typical construction project. — Review resources to find more information about natural stone standards. — Learn how to plan for the longevity of an installation by specifying appropriate materials. — Evaluate factors specific to the price of different materials, finishes and methods. Please register by Monday, September 12 in order to guarantee food. Please join us at Frank Cinebowl & Grill, where you can do a little socializing, a little bowling, and demonstrate your kitchen and bath knowledge with our Quiz Bowl: Bowling for Kitchens. We have four dedicated lanes behind curtains for privacy and exclusivity. It doesn’t matter if you’re a bowling superstar or a novice. This is also your opportunity to vote for incoming chapter board positions. Please register by Monday, August 8 in order to guarantee food. We are beyond excited to feature Vivian Howard, award-winning chef and star of the PBS series, A Chef’s Life, as she welcomes us to Chef and the Farmer, the restaurant she and husband, Ben Knight lovingly own and operate. Vivian will share a professional chef’s viewpoint about her own preferences in her personal and commercial kitchens. Attendees who will experience an extraordinary meal prepared by the talented staff of Chef and the Farmer. Sponsored by Sub-Zero and Wolf. Born in Deep Run, NC, to tobacco and hog farming parents, Vivian Howard learned early on to appreciate the ebb and flow of eating with the seasons. Still, it took 23 years and a start in the advertising business to convince her a career in food was feasible. After college, Vivian moved to New York for work, but found the City’s food and restaurant scene far more intriguing. A server position at Greenwich Village’s, Voyage, made it possible for her to begin training under the restaurant’s Chef, Scott Barton. She later went on to learn from creative, cutting edge Chef’s, Wylie Dufresne and Sam Mason at WD-50 and later, was a member of the opening team at Jean-Georges Vongerichten’s, Spice Market. In 2005, Vivian, and her now husband, Ben Knight decided to return to Vivian’s roots to open a farm to fork restaurant in the small town of Kinston, NC. They opened Chef & the Farmer in the summer of 2006 serving local, seasonal, creative cuisine. Over the past eight years, Chef Howard has developed strong relationships with local farmers making it possible to source over 70% of the restaurant’s foodstuffs from within 60 miles . Chef and the Farmer has become beloved by locals and a destination for diners all over the state. Eastern Carolinas NKBA is excited to welcome back John Morgan one of our most popular speakers, to share his latest insights on using virtual reality technology in the kitchen and bath industry. This is also our first membership drive of 2016, offering special pricing and chance to attend a future meeting at no cost. *Friend must be a first-time attendee of an NKBA meeting. Not valid for June 16, 2016 event. Kindly Register by May 6, 2016 in order to guarantee food. We cannot give refunds due to venue/catering deposits. Send questions about this event to anne@freshkitchenandbathdesign.com. 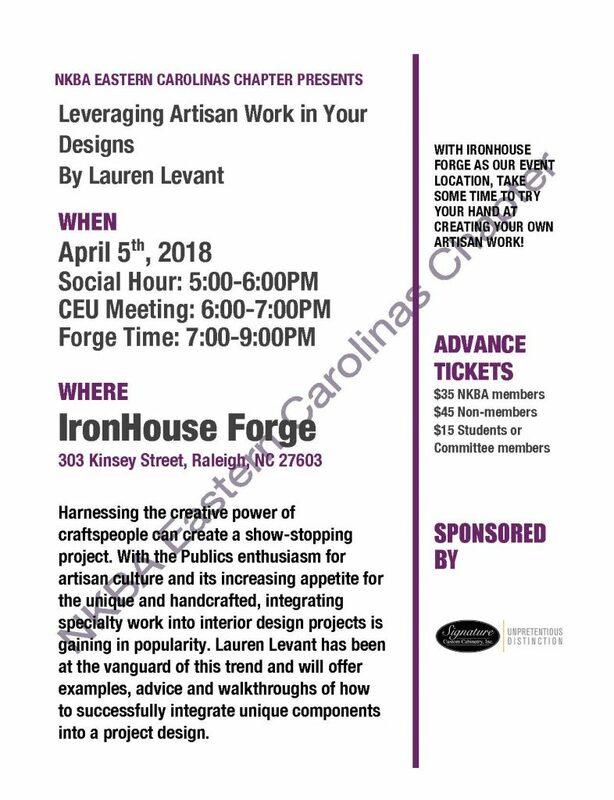 Please join Eastern Carolinas NKBA for an exciting meeting hosted by Liberty Hardware. Following the presentation, attendees have the opportunity to review and provide feedback on new product designs and finishes. Kindly Register by March 7, 2016 in order to guarantee food. We cannot give refunds due to venue/catering deposits. Sponsored by Liberty Hardware and Franklin Brass. Approved for .1 CEU credits. Come to the first 2016 meeting of the Eastern Carolinas chapter and learn about glass tile so you can confidently specify the right products for the right applications. There are many types of glass on the market. Melissa Reynolds of Oceanside Glasstile will cover the history and ingredients of glass tile, quality standards in place to help protect the consumers, as well as manufacturing, mounting, sustainability and installation methods. Kindly register by February 8, 2016 in order to guarantee food. Sponsored by Oceanside Glasstile and Traditions in Tile at Brier Creek.